Taireva, Nhemamusasa, Nyamaropa… These are all pieces in the repertoire of the mbira that is said to consist of several hundred songs. But what makes an mbira song? An mbira piece consists of a basic cyclical pattern which includes numerous intertwined melodies, often with contrasting rhythms. Since the extensive possibilities for rhythmic and melodic variation render each rendition unique, what makes Nhemamusasa Nhemamusasa? An mbira piece itself is not a fixed musical structure with a specified beginning and end; it is a composition of certain characteristic cyclical patterns that provide a framework for elaboration and variation supporting the creative expression of the performer. Shona mbira music consists of a continuous stream of subtly changing musical ideas; its texture is like a fabric of tightly interwoven melodic/rhythmic lines that interact with each other throughout the performance of a piece. Can we describe or define a piece by a particular melody? The basic pattern of keys played? As the mbiras play through continuous cycles, they expand the collection of pitches. Each cycle brings a new configuration of the existing pattern, and in this way new patterns emerge. Can we define a piece by its harmonic structure? Musicians associate or distinguish mbira pieces on the basis of numerous formal aspects: harmonic structure (discussed below), characteristic rhythmic and melodic patterns, the pitches which comprise them, tonal centers, the number and length of the basic phrases, amount of variation associated with each piece, and the relationship between the piece’s kushaura and kutsinhira parts. He describes several formal features that mbira musicians use to describe mbira pieces. Which keys are played. 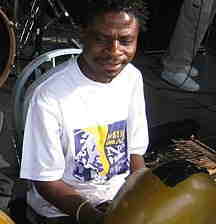 Some compositions are played with “different mbira keys” (that is, they utilize a different selection of the mbira’s pitches) while others use the “same keys, played differently.” This means that the same basic pitches may be used in a number of pieces, employed differently in each to produce that piece’s characteristic melodic and rhythmic patterns. None of these in themselves necessarily describe a “song.” Many songs use the same configuration of keys, yet rhythmic differences and playing patterns create different songs. Below we describe three songs that utilize the same mbira keys: Kariga Mombe, Nyamaropa and Mahororo. Some songs share an overall harmonic movement but different harmonic rhythm. See The Soul of Mbira for Berliner’s comparison of the harmonic changes in Nyamaropa and Mahororo. The rhythmic relationship among the melodic lines also differs between pieces. Some songs share basic elements of harmonic and thematic structure while having different tonal centers. Nhemamusasa and Nyamaropa, for example, follow the same overall harmonic progression and have similar thematic development while having different tonal centers. Some songs have the same tonal center and share harmonic patterns but differ in their structure. Kuzanga, for example, shares Nhemamusas’s tonal center and some of its harmonic progression. But Kuzanga’s phrases are 9 beats each not 12. While two of its four phrases follow a harmonic progression similar to Nhemamusasa, two do not. Given all the formal factors that can make an mbira piece unique, and given that a traditional song’s composition is passed down orally and aurally, it is not surprising that mbira players don’t always agree on the name of a piece of mbira music. The source of the titles of some mbira songs may be lost to history. When there is agreement on a song’s title there may be great variety in the meanings attached to the titles, and it is not at all unreasonable to think that song title that hundreds of years ago were associated with war might become adapted to a more peaceful hunting culture. Nyamaropa, which literally means “meat and blood,” has been described … as referring to the period after a hunt when meat is all around, as “a war song to arouse feelings before the battle, as the scene of a battlefield after fighting when blood and flesh is everywhere,” and as having “to do with the blood of a beast when it is sacrificed for the [ancestral spirits] ” More recently it has been spoken of as hunting song. Nhemamusasa is generally translated as “cutting branches for a temporary shelter.” Paul Berliner’s teachers described Nhemamusasa as a song for war in which soldiers make shelters for the night, while others describe it as a hunting song in which hunters make temporary shelters as protection from the wild animals in the bush. Quite a few mbira songs share significant enough characteristics to be spoken of as “in the same family.” It is assumed that many of these songs evolved from one early parent song as musicians came up with significant enough variations to start giving their variations a new name. An mbira piece is normally defined by which keys on the mbira are played, not by the absolute tones that sound. (This makes transcribing mbira music to staff notation virtually impossible, although it does not stop people from trying.) Many mbira pieces can be played in multiple tunings. The mbira player plays the same keys in the same patterns; what sounds from the mbira can be strikingly different from tuning to tuning. As mentioned above, certain mbira songs follow the same overall harmonic progression and have similar thematic development while having different tonal centers. And so it happens that one mbira song when it’s keys are played in a different tuning sounds like a different song. Because of the role that mbira songs play in spirit possession ceremonies, a value is placed on songs that have been played in the past, as these are the songs ancestral spirits want to hear. This essential role of the mbira song assures that songs pass from generation to generation. Although people often speak of a song as being one played hundreds of years ago, it is impossible to know precisely what was played given that mbira songs are passed down aurally and orally. What we do know from observing mbira over the past, say, half century, is that it is common for mbira musicians to create new variations of traditional pieces. Often these variations are played along with more traditional variations. But sometimes a new version of a song, although derived from a traditional song, becomes so different that is no longer played with the song it evolved from. Tute Chigamba has composed several songs that can be identified as variations but have evolved into separate songs. Some examples from the current repertoire of mbira suggest how difficult it is to accurately speak of the songs of the distant past. Nhemamusasa Yekutanga (the older Nhemamusasa) shares the same tonal center and basic harmonic structure as the song now known as Nhemamusasa. It can be played along with the current Nhemamusasa or played on its own. Nyamaropa Yepasi has diverged enough from Nyamaropa that it no longer shares the same tonal center and harmonic structure as “Nyamaropa” and can not be played together with Nyamaropa. Paul Berliner writes that John Kunaka reported that one source of new pieces were dreams in which he was assisted by ancestral spirits. The “new” pieces a person learns in dreams, he stated, are actually the ancient pieces of the spirits who are teaching him. Could the new pieces be old pieces the spirits want to hear again? Copyright © 2019 Tinotenda. All Rights Reserved.